Hopping time to be in Battle Creek! April is here and there is so much going on this month at the library and in the community! We have an exciting living history program presented by Darrel Draper where he will perform in character as President Theodore Roosevelt. This educational and entertaining program is for people of all ages and will be held at the Community Pride Care Center at 2:00 Sunday, April 7th. The next Saturday the library will be stuffed with children and families as they get to make their own stuffed animal at our Make a Pal Stuffing Party. Ms. Cherie Werner will read a heart-warming story about the wonderful role our stuffed friends make in our lives then the stuffing will begin! If you missed the pre-order date there are extra “pals” available for the cost of $12 each. Inquire at the library for more information. Do you love pancakes? If you do April in Battle Creek is going to be a lip-smacking month for you! On April 7th the youth group at St. Johns will be having a pancake feed from 10:30 to 12:30 with Grubbs providing their delicious pancakes. Then on Saturday, April 13th the Battle Creek Lions Club will take to the griddle to flip up some mouth-watering pancakes at the community clubhouse in the city park. They will begin serving at 10:00 and continue till 1:00. While are mouths are watering over pancakes, don’t forget there’s also a few more Friday night Knights of Columbus Fish Fries at St. Patrick’s Parish Hall. They serve from 5:30-8:00pm and carryouts are available! Our schools have book fairs, plays, and sporting events as well this month. One event to note is the Battle Creek Scholarship Banquet on Friday, April 5th. The speaker will be alum, Angie Klein. Make sure you call the high school for your reservations! Is that music you hear? Well, not yet, but there will soon be music and dancing at the Fire Hall for the Annual Fireman’s Ball on April 13th from 8:00pm to 1:00am. Ask your favorite fireman for tickets! That’s not the end to the Battle Creek events! Easter is coming! That means worship services at St. Patricks and St. Johns but also a special visit from the Easter Bunny. There will be an Easter Egg Hunt for children ages 0-8 at the city park on April 13th at 11am. So on April 13th, you and your child can come to the library at 9 make a stuffed pal, head to the park for some pancakes from the Lions Club, have the children find eggs at 11 and then go home take a nap and find a babysitter and come back into town for a night of music and dancing. Sounds like a hopping fun day and a wonderful month to be in Battle Creek! PS… If we’ve missed any community events, we apologize! In the midst of the coldness of winter, we get to enjoy the wonderful month of February. Not only is February the shortest month, it is the month of love with Valentine’s Day falling in the middle. We set this day aside to remind ourselves to simply say, “I love you” to our friends and family. February is also a month where we get to honor. We get to honor those who have served our country in the highest public office, the presidency. We also dedicate this month to remembering and honoring those who have struggled for their civil rights by observing Black History Month. Whatever you chose to do this month in the midst of the coldness of the continual winter, we hope you take the time to simply love and honor. And, if you are so moved, we’ve got plenty of books to help you do both. It is almost t ime to bid a fond farewell to our library director of 17 years, Kathy Bretschneider. 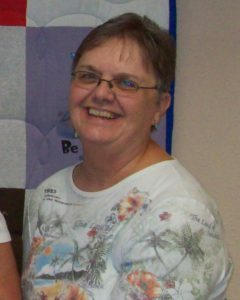 Kathy has served the community of Battle Creek faithfully with her wit and knowledge of all things English. The City of Battle Creek will host an open house for Kathy on Friday, November 30th from 3pm to 5pm in the library meeting room. Come wish this special lady a very happy retirement! From Labor Day to Patriot Day and Autumn’s haunting call, this month reaches out to pull on your memories and walk you through life’s changes. This is a month of enchanting color to push you onward toward a quiet reverie as memory reclaims your longings. What can the Fall do to fulfill your dreams and brighten memories? A tug at your heart, a whisper to your brain will lift your heart towards old memories and new good times. No one can see what you feel, but you can fully feel what you see in a turn of season. Watch children race toward a pile of leaves, yellow, orange, tan and red. In a flash of energy they leap and spray the leafy mount, rolling and falling toward a merry heap of arms and legs reaching for the exhilaration of the season. Anyone else watching might wish for such freedom, and resist the display of childlike feelings. Little ones recognize a wondrous event and dive right in. Shouldn’t we all, in some way? Never resist the call to enjoy nature’s call for play or the fragrance of a zesty Autumn! It’s a treat! School bells ring–are ya listening? It’s Fall, y’all, and the youngsters are heading back to school. It’s a great time of year for the children, as they will soon begin to have lots of friends and fun both during and after school. Their parents will also enjoy this season for many reasons. There’s a break from parental oversight while they’re in school. School will provide plenty of activities for children to enjoy and for parents to see and hear also. Some of the most enlightening things happen at teachers’ conferences and sports events–not to mention school plays and band events. Members of the same family can easily enjoy the talents each member has at these moments, and quite often there are great things to brag about and a few funny ones to giggle over. Now, I’m not saying that school isn’t a serious business. For goodness sake, I taught Junior High and High School students for 15 years. But the parts that stick in your heart the most should be the fun, the learning, and ‘oopses’ that go along with it. Memories of these times can be something to cling to in not-so-fun times and revived to encourage us all to cling to our past a little. Have a great year kiddos. Enjoy, enjoy, parents. I’m a parent and grandparent and I wouldn’t trade any of the serious or hilarious times. Have fun teachers, principals, lunchroom cooks, school nurse and all the other folks who live at school. It’s worth it. July will soon slide into August and many wonderful opportunities are looking for you, kids. You still have a few short weeks of summer fun, of course, and that is a real opportunity. One thing you could do is take a vacation to somewhere close that is not expensive and yet full of fun; like: the County Fair in your area–or a rodeo if it’s close enough. Explore area lakes and rivers (with your family and friends) and find out how great it is to be a Nebraskan. Some Nebraskans enjoy inviting their neighbors for an outdoor dinner, especially if they live in the country. Someone who might be visiting from out of state would most likely love an invitation to a country barbecue (or even a small town barbecue): does anyone have Gov.Pete Ricketts’ email? Other ideas might include visiting grandparents wherever they live or inviting them to your outdoor barbecue. You might even try writing a card or note to the teacher you will be working with next school year: tell he or she what your best qualities are or an activity that you’ve never tried in school–like being pen-pals with the principal. Summers are short but there is still some time to look around and describe to your mom or dad what is best about Nebraska summers. Better yet write a pen pal and invite them to see how much fun we have. Remember always that if you and your friends were born in Nebraska, there are many children who weren’t. You could start a Pen Pal Club with your classmates and write to those children asking them what is the best feature of their state. How do you find them? Start with cousins or friends who live elsewhere. Or when you go back to school ask the new kids who just arrived. It’s a great way to find a new friend. And don’t forget to tell everyone how great the weather is here in good old Nebraska! Wedding plans ‘n’marching bands carry us on. Sunny parades share a summer song. Flags of our Fathers steel our hearts and weld our pride. Time’s a wastin’ ; and that’s no lie. Wedding plans ‘n’marching bands carry us on. Colorful parades toast a summer song. Flags of our Fathers steel our hearts and Time’s a wastin’ to do our part. *On June 7, at 4:30 p.m., Jeff Quinn will entertain us with magic, laughter and music at the Battle Creek Elementary Gym. *Visit the Lied Battle Creek Public Library on June 21, 2 p.m. to enjoy some great music, featuring Connie Lade and her guitar. Refreshments are quite possible and fun is guaranteed. May, we join you . . . The current month is justifiably important to Americans. Three holidays present a real picture of the devotion of our people to ‘life, liberty and the American way’. Most citizens of this world love their home country and its celebrations of life, to be sure. But the month of May in the USA represents some of our deepest, emotional ties to each other as citizens. Mother’s Day (this year May 13) reconnects families in so many ways. American families rely so much on their mothers for family history, traditions, and what’s cooking on special occasions. Togetherness is represented on this day in May as a tradition. Without Mom there would be no family. Dad, of course, gets his due on Father’s Day in somewhat the same way. He’s the head of the household, its leader and guide. Yet Mother is the glue, the emotional center of the family. Both are needed and respected. Armed Forces Day on May 19 is a tradition in the USA evolving over the years of conflict and struggle to maintain our way of life, and protect our citizens. Celebrating and honoring the American soldier, who fought and sometimes died in defense of this land, is an honor we cannot forgo. As time has a way of changing things, our Armed Forces are not just men, but also women these days. We salute those who face great struggles and desperate times on behalf of our country. And we admire those who come through the strife with a quiet pride at our country’s progress. Last, but not least, Memorial Day is an honor and duty Americans serve with gratefulness. Memorial Day represents the Americans who fought and died, or served and survived, perhaps. But it is also a time to remember fellow citizens who pass away and are remembered for their part in our way of life. Truly, this month gives us much to reflect on and to talk proudly about. Oh, there are many times in a year Americans celebrate their fellow citizens and their country. And it’s good to think about how lucky we are to work here together–to challenge each other and congratulate our country on its ability to move ahead and to glance back in time somehow. National Library Week will be observed April 8-14, sponsored by the American Library Association and libraries all across our country. There are many types of libraries that participate: school, public, academic, and special. All share leadership in information and education for our citizens. The dedication to accurate and unprejudiced information is a keystone to our nation’s progress and development. 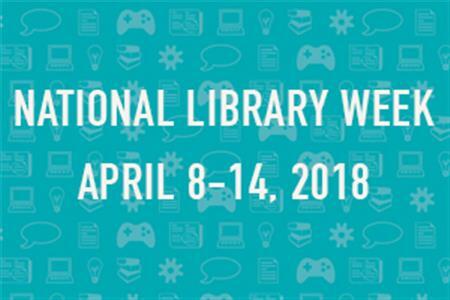 Celebrations for National Library Week include: National Library Workers Day (April 10, 2018), a day for recognition of library staff, administrators, users, Foundations and Friends groups and of efforts of local governments to support these local entities that work with them and for them. On Wednesday of National Library Week (April 11, 2018), many libraries celebrate National Bookmobile Day, recognizing the outreach made possible in many communities and rural areas. On Thursday of National Library Week (April 12, 2018), we celebrate Take Action for Libraries Day. This is an effort to advocate for support of local libraries’ efforts to improve opportunities for all segments of our society, and to equip citizens with information and opportunities to improve their way of life. Local libraries do more than house important documents, books and other resources. They can provide a forum for discussion of the particular needs of the community and provide resources to equip local leaders with information that will support the needs of the community. More than that, libraries support interaction among their citizens that feeds the need for knowledge and support for necessary action and discussion. Lied Battle Creek Public Library staff believes in working with fellow librarians in our county, state, and region to promote the values of education, information, leadership and friendship. Come in during Library Week and discuss needs you see as incomplete in service. March into a new season ! This month is going to grab us by the hand and whisk us away. It’s already looking like Spring is coming: flocks of ducks flew overhead this morning when I came to work –and they were headed North! However, I was going South to the Public Library with sun shining in my face and a yellow cat running alongside my car as I headed for the river bridge. I don’t know where she was going. Remnants of snow scattered along my path as I got closer to Battle Creek, and now at 1:40 pm, there are more puddles than little snow drifts along the street. Business was a little slow from 9 a.m. till closing. A few adults and a handful of children came in and retrieved books to read or movies to take home, but it’s possible other people were busy outside. Our small quota of patrons didn’t stay too long either. It’s a little nippy yet, but this looks good for the beginning of Spring. You know, those ducks were encouraging each other to keep flying–pretty loudly, too. It made me want to shout a little. If the weather stays friendly, it will be somewhat harder to stay inside and work. It might be tempting to play hooky and enjoy the weather. Who knows? A holiday might come along and rescue us. It’s been known to happen. Now what is the next holiday coming to our rescue??? And then it snowed! I guess the next holiday must be Grab Your Shovel Day, right? Copyright © 2019 Lied Battle Creek Public Library. All Rights Reserved.